Homemade sausage doesn’t have to be put into links. Sausage patties are versatile, or you can just freeze it in bulk shapes and break it down for ground sausage recipes, like for pizza, or Italian sausage spaghetti sauce. Even if you do want link shapes, you don’t even have to have casings! Let the links fall into plastic wrap until you’re sure you want to mess with casings. (See photo on this page.) When you're first learning how to make sausage, keep it simple. A sausage stuffer is needed for stuffing sausage into casings. You can use the sausage stuffer attachments for your meat grinder, but it is slow and the process can be problematic. 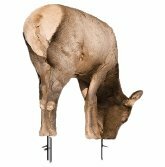 It’s worth trying, but you’ll soon want a standalone stuffer. That is, if links are required. A stuffer runs $150-$500 at Cabela's. Don’t assume you have to have one at all until after you learn now to make sausage your way, then decide. You can use wild game or store bought meat. 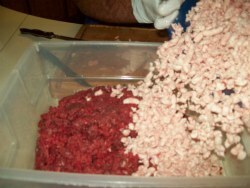 If you start with purchased ground meat, all you have to do is mix in the flavorings and you have ground sausage! Most people use a sausage seasoning blend. There are many flavoring choices. We have tried many different commercial sausage seasoning mixes. There are lots of good ones out there, but at this point our favorite isA.C. Legg Old Plantation Seasonings. They have a great variety and the blend packets come measured for 25 pounds of meat. I have arranged for you to get a a 10% discount. Find some blends to try and enter code "7777" at this site: www.BestSouthernSeasonings.com Savings code will work every time you order. If you want to grind your own meat and learn how to make sausage without links, the only thing you really need is a meat grinder that doesn’t drive you crazy. By that I mean one that won’t make you hate the process. If you have lots of patience and time, you could even use a hand grinder. We have used cheap electric meat grinders and found hand grinders to be better! A next step up would be a smaller grinder that is powered by about 300 to 575 watts. They are sometimes referred to as “heavy duty”. Well, maybe they are compared to a small useless one. These work, but you will find yourself having to take the blades out occasionally to clean out the gristle that gets stuck. I thought I was taking a big step up, but I never enjoyed using our 575 watt LEM grinder for that reason. If you just want to make three to five pounds at a time, these will work fine. 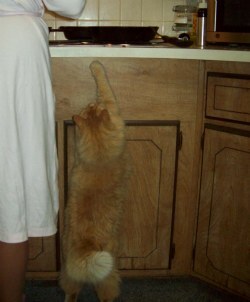 Just realize that once you learn how to make sausage at home, you will want more than that and you might have to share! The grinding process with these smaller grinders is slow and a bit tedious, unless you have no gristle in your meat, which means you are using premium steak and roast cuts! 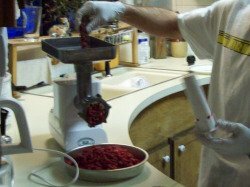 You don’t have to get the biggest grinder on the market, unless you want to know how to make sausage by the hundreds of pounds in a few hours. A grinder measured in horse power is the next step up. They start from ½ horse power, up to about 2 horse power before getting into industrial sizes. I actually enjoy using my .75 h.p Gander Mountain Guide Series #12 3/4hp Grinder (#12 neck, 8 pounds per minute, 450 watts). A faster grinder would not speed up the process much at all anyway. A larger grinder would certainly do more faster, but then you still have to mix it and package it. A mixer is an additional cost and requires more storage and work space. 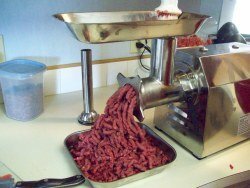 With a ¾ horse power meat grinder, two of us have gotten the process down to less than four hours for 25 pounds of finished bulk sausage. (That’s with the NFL football game occasionally distracting me.) That includes clean up, weighing and wrapping one pound chubs (like Jimmy Dean sausage comes in). The chubs are ready for slicing into patties as needed, or to be used in a recipe in bulk. 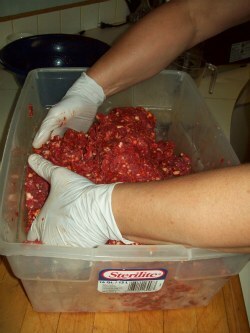 Eight or nine pounds of ground meat requires a pretty big pile of cut up meat and a good size bowl or tub to catch it as it comes out of the grinder. If your tub is too big to fit under the grinder, you will need a bowl to catch and transport it over. Cutting, weighing accurately and mixing the right proportions of meat, fat and spices by hand takes the most time, especially without an electric sausage mixer. When you're fist learning how to make sausage the weighing and measuring process might seem tedious, but like anything else it gets quicker with practice. In my mind, spending more money on a mixer that I don’t have room to store is not worth the few minutes it will shave off the process, unless I was doing hundreds of pounds at a time. Besides, I kind of like the feel of running my fingers through very cold meat with a sausage aroma. Meat that I first saw standing alive in front of my bow or gun! •	Meat: wild game, beef, pork, turkey, etc. 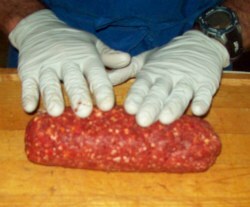 If you use food service or "exam" gloves while working with meat and fat, they can be changed often and keep you from getting greasy, bloody hands. Refreezing meat does indeed downgrade the texture of meat some. (It does not affect food safety.) I don’t care. I do it anyway. I don’t notice much difference with ground elk, venison or beef. If you can make sausage with fresh, never-been-frozen meat, you might be able to perceive a little better texture. 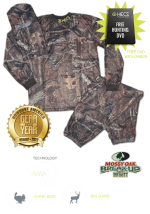 When we kill a couple of elk and some deer, keeping it unfrozen is not gonna happen. In the summer we’re making sausage and ground meat from last fall’s wild game. Just be sure to thaw your sausage (or any meat) before starting the cooking process. 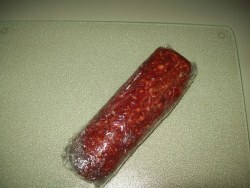 I like grinding and making sausage from frozen meat because it is easier to cut and grind. Plus, it stays cold throughout the process. I put about 3 pounds of frozen solid meat at a time in the microwave on the thaw setting for about 10 minutes. Microwave ovens vary, so check it after several minutes. When the outside of the meat starts to get soft, take it out and start thawing the next batch. You will get the timing down and can keep the thawing process going while you're cutting and grinding. Just keep putting 3 to 5 pounds at a time in the microwave while you work on the batches of semi-thawed meat. I like to start the process with meat that is frozen enough to still have to struggle a little to cut it with a serrated edge knife. By the time I get done with the last step of mixing my sausage, the meat will still be very cold. It’s also easier to trim off the fat and silver skin from wild game (doesn’t taste good) when it is partially frozen. If you start with unfrozen meat, put it in the freezer for a couple of hours to get it very cold first. It will firm it up a bit. Also, put your hopper, grinding plate, bowls, etc. in the freezer for a while, too. You need to keep your meat cold throughout the process. You might need to take an occasional break while you put your equipment back in the freezer for a while, if you are using unfrozen meat. Cut the meat into steaks and then into strips about an inch thick, so it will fit into your grinder hopper. When you’re first learning how to make sausage, or grinding meat for the first time, cut up about 3 to 5 pounds into one inch strips, and then start feeding it into the grinder, letting it fall into the tub or a large bowl. (Use the course grinding plate.) Once you get the performance of your equipment and counter space figured out, you can adjust the size of batches that you cut up and grind, as desired. Start with frozen suet, too. It is very difficult to work with fat that smears all over everything. It also gets caked up inside your grinder, if it isn’t frozen. Your frozen suet does not have to be thawed at all before cutting. Cut chunks off of the frozen mass of fat and feed it into the grinder. We get suet for free at the local supermarket meat counter. They charge for it once hunting season begins, so we take advantage of the freebie fat before hand. Decide how much sausage you’re going to make. When you're fist learning how to make sausage, you should probably start with a sausage mix. You can always experiment with your own blends later, if you like. Note how much mix will be required and weigh out the frozen meat, fat and spice blend to match your plans. If you want to make 25 pounds of finished product with 25% added fat, multiply .75 X 25 pounds. (For 20%, .80 X 25, etc.) For a 20% fat blend you will need about 19 pounds of trimmed meat and 6 pounds of fat to make 25 pounds of sausage. Git Yur Hands In It! Once you get your meat and fat all ground up and in the tub, you’re almost ready to add your spice blend. First mix your carefully measured sausage spice blend with a little water (see below) to help it disperse throughout the sausage. Depending on the product, the amount required is from about a half to one pound or so of seasoning blend for 25 pounds of meat. Follow the package directions carefully the first time, then adjust to your preferences. Once you’re hands are thoroughly frozen (try cotton gloves under the food service gloves), either trade off with someone else, or take a break and do it some more. Just make sure it’s good and mixed up. The next process is to run it all back through the grinder (course plate again) to make sure the fat and meat are blended up thoroughly. Some might prefer a fine grind. We do not. You’re just about done with your first simple lesson on how to make sausage! Decide what size batches you want to freeze. Weigh out each batch, and then roll it into the shape chubs you want on your cutting board. It helps if someone with clean hands can layout your paper or plastic wrap on the counter, then wrap it. Place each log, or “chub”, onto the wrap and roll it up, folding the ends over as you roll it to make an airtight package. You can place several wrapped chubs into freezer bags for further protection from freezer drying (“freezer burn”). Label each bag with the date and name of your seasoning blend. Keep one out for dinner and put the rest in the freezer! Clean up is no fun after making home made sausage. Have a cup of coffee, glass of wine or a beer. After the mess is all wiped up, use a small amount of bleach in water to kill germs. (Just a few drops per quart of water is enough.) Let your counters, equipment and cutting board air dry after wiping with the weak bleach sanitizing solution. Questions or comments about how to make sausage? When you’re first learning how to make sausage, remember that it is not an exact science! It’s more of an abstract art form. (No one can tell if you did it "right"!) Be flexible, as in all food preparation. Homemade sausage is habit forming. When the word gets out that you know how to make sausage, friends might begin to impose upon your hospitality! Once you learn how to make sausage, you’re ready to go watch your local legislature in session. Making sausage will not seem so messy after that!